We had a lovely day for the pretty ride from Prague to Bratislava, the capital of the Slovak Republic. The first 80 kilometers were a mixture of forests, running rivers, and rolling green hills. As we approached Brno near the border, the scenery changed to lush agriculture, vineyards, fruit trees and crops of all types. Hotel Danube, Rybne Namestie 1, danube@internet.sk, is located on the Danube River in the historical city center. The design is modern inside and out. The large wood and marble lobby has lots of inviting seating for relaxing when necessary. The rooms are pretty basic with inexpensive modern furnishings and fittings. The recreational and business facilities are quite good, which business and leisure travelers would find appealing. However the mattresses slumped and it was necessary to put a bucket under the leaky pipes below our bathroom sink. The buffet breakfast was very good. The population of Slovakia is 5.3 million with 453,000 living in Bratislava. One third of the population lives on the right bank in a concrete jungle built in the 1980's. Views from the castle high on the hill of the left bank are spectacular. The castle is large and very imposing. There is major reconstruction underway to improve the property and increase its commercial potential. The Jewish community lives in the old homes of the old Jewish section located on the hills of the left bank. The old Jewish cemetery is extremely unique, located underground as it is beneath a streetcar line. The man who tends the facility came to unlock the door to an ugly, small, cement building and led us down the stairs to the cemetery. It's pretty eerie. The middle of the room is raised and filled with tombstones. Other tombstones are mounted on the walls. This cemetery room was originally at street level but when the street level was raised, a cement roof was put over the cemetery to preserve it. Rabbi Chaim Sofer, esteemed for being good, wise and establishing a yeshiva and synagogue, is buried here. The old town is very attractive. A few steps from the hotel is the site of the Jewish synagogue that was demolished as part of a bridge construction. Nearby there is a memorial to the Holocaust, adjacent to the St. Martin cathedral. The old Town Hall, with its tower and courtyard with flower-covered balconies is a beauty. The Pink Palace, now the offices of the Mayor, in Primacialne Square is most attractive as well the cream and yellow building housing the Slovak National Theatre. This is a university town so it was no wonder the streets were filled with young people. The outdoor cafes all had televisions rigged-up because Slovakia had done the impossible, made it into the hockey finals playing against whom else but the Czechs for the gold. It was quite exciting with cheers blasting throughout the town. The group had a kosher dinner at Chez David, Zamocka 13. After a trio of starters: chicken salad, mixed salad and mushroom soup (all of them! ), we had a choice of turkey schnitzel or roast duck. We enjoyed it all and the apple strudel for dessert. 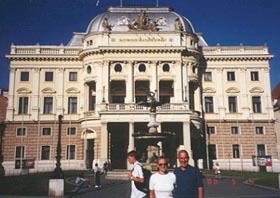 We had been to Budapest many years ago and, frankly, could not wait to leave. What a change! So much so that we were sorry only two nights had been scheduled for our visit. It has been cleaned up considerably and the revival is well underway. We stayed at the Hyatt Regency, Roosevelt Ter 2, which is located on the Pest side of the Danube a stone's throw from the Steel Bridge, the major crossing to the Buda side. It's a vintage Hyatt with the open atrium design. The rooms are modest in size and are getting tired. The public areas on the ground floor are spacious and gracious. The buffet breakfast is very good but the staff was rude and insolent. The location is excellent but I will look for better value next time. Since we had some free time after arriving and knew we had a complete city tour on the following day's agenda, we decided to cross the Steel Bridge to the Buda side and explore some non-touristy areas we had not seen previously. This bridge is a symbol of Budapest because of its unusual design. An English engineer, William Clark, who imported the iron from England for the construction, created it. Famous stone lions stand at the bridgeheads. Great weather was with us as we strolled the Buda streets between the Steel Bridge and the Margit Bridge just to the north. It's a quiet, residential neighborhood with interesting homes and apartment buildings and as the afternoon wore on the smells of dinner preparation filled the air. On walks like this we try to discover restaurants and hotels of interest. At #27 Fo Utca a corner restaurant, Horgasztanya Vendeglo, looked quite interesting with a casual nautical atmosphere inside and a comfortable patio outside. 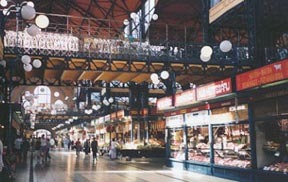 The menu featured fresh water fish, game and traditional dishes. We made a date for later on in the evening. As we turned back to the Danube at the Margit Bridge and stayed on the Buda side heading south back to the Steel Bridge we were reminded of the pleasant time we had spent on Margit Island. It's like the Central Park of Budapest, with the added advantages of a swimming pool, thermal hotel and game park. Right along the Danube at Bem Rakpart 11, we found the Hotel Victoria with wonderful views of Pest across the way. We looked at some rooms and decided it would be worthy of consideration for next time. We asked the front desk people for a restaurant recommendation in the area and they immediately suggested the one we had visited - a good sign. Group members Esther, Sam and Vicky joined us for dinner. The owner graciously greeted us and did his best to explain the menu and make recommendations. I started with a marvelous fish soup (a half portion); the rich fish broth was filled with pieces of carp and seasoned with garlic, bay leaves and lemon and garnished with a dollop of sour cream. The others had a substantial tomato and onion salad on a bed of lettuce. Linda had roast pork with delicious mushroom cream sauce while three of us enjoyed whole, roasted trout with browned potatoes. Simply super. Vicky was disappointed with her fried carp, unfortunately. This is a delightful neighborhood eatery with a caring kitchen and service to match. The cost is extremely reasonable. Our tour started in Pest, motoring up the charming Andrassy Avenue. We continued from the heart of the city at the Basilica to Heroes' Square and the City Park. One day we will take the time to walk up and down the tree-lined Andrassy and truly admire the gorgeous architecture and enjoy a coffee at one of the inviting cafes. The huge Heroes' Square is home to striking monuments and both modern and contemporary art museum. The sheer size of the square is awesome. The sprawling park has something for everyone with playgrounds, sports facilities, indoor thermal pool, outdoor pool and a special section for the visually impaired. On the grounds is Vajdahunyad Castle, which was built in 1896 representing Hungarian architectural styles over the ages. The pond beside the castle is for boating in summer and skating in winter. Also nearby is the zoo. The Dohany Street Synagogue is the second largest in the world. It has recently reopened after extensive renovations. It was originally built between 1854 and 1859 and managed somehow to survive World War II. The design is elegant, highlighted by the gorgeous woodwork. The main floor seats 1500 (men) and the balcony slightly fewer (women). 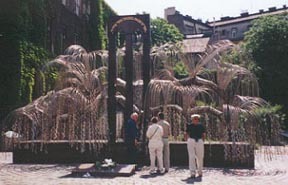 The memorial cemetery and the Tree of Life Holocaust Memorial are contained in the Raoul Wallenberg Memorial Park in the rear of the synagogue. Sitting proudly on the banks of the Danube is the vast and stately Parliament Building. Much of the facade is undergoing restoration but enough was showing to demand special notice. While Pest is flat, Buda is high with three hills rising above the West bank. The best panoramic views of Budapest are from the Fisherman's Bastion on Castle Hill. The bastion was originally built as a frame around the Matthias Church. Gellert Hill is the elegant residential area of the city. Magnificent homes greet you at every turn as you maneuver up, down and around the high hill. The Gellert Hotel and its famous baths is the other famous landmark in this area. Late in the afternoon, the two of us strolled up the main pedestrian shopping street, Vaci Utca, to look in the windows and people watch. We were pleased to see that the pedestrian mall had been continued beyond the Erzsebet Bridge; an area that had previously been pretty seedy was now a delightful walkway with lots of nice shops, restaurants and cafes. The side streets also had been treated to some sprucing-up. At the end of this pedestrian way is the huge indoor market where we had a great time trying not to buy anything. On the way back we stopped at a gorgeous-looking Greek restaurant, Taverna Rembetiko Pireus, Fovam Ter 2-3, for an early dinner. The only reason we mention this place is to suggest that you don't go there. The food is awful and they severely overcharged us for ouzo. Back at the hotel we found the entrance surrounded by police and waiting limos at the front doorway. We discovered that Prince Charles was attending a meeting and would soon be departing. Linda snapped a few shots but unfortunately his bodyguards managed to obscure most of His Majesty. There is a lot more to see and learn about Budapest and we hope to get back in the future to do just that. Our organized tour was over and we were off for a special night in Amsterdam and a morning flight to Zurich for a nine-day stay in Switzerland.